In the wake of the film adaptations of Lord of the Rings and Harry Potter, The Chronicles of Narnia have always felt like adorable younger siblings to these other fantasy epics. Despite this, on the franchises’ third outing with Voyage of the Dawn Treader, it ranks almost as good as Harry Potter 7 pt 1. 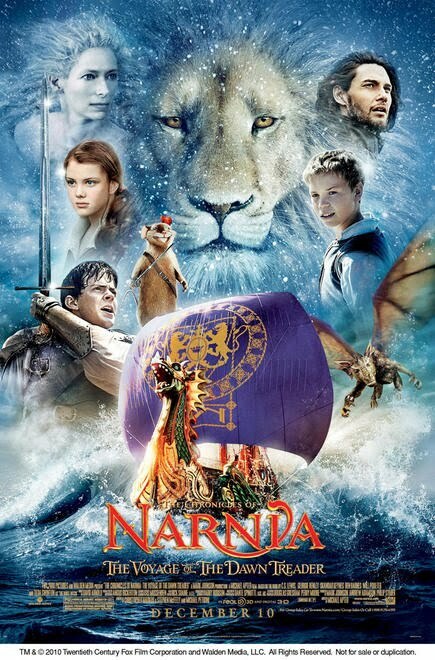 In this chapter of the Narnia series, the four Pevensie children have been separated by World War II, with elder siblings Peter and Susan in the U.S. while the younger Edmund and Lucy are left stranded with their obnoxious prat of a cousin, Eustace. The three are then transported to Narnia, where Lucy and Edmund join Prince Caspian in searching for lost lords, and in doing so find a foggy darkness kidnapping the locals. 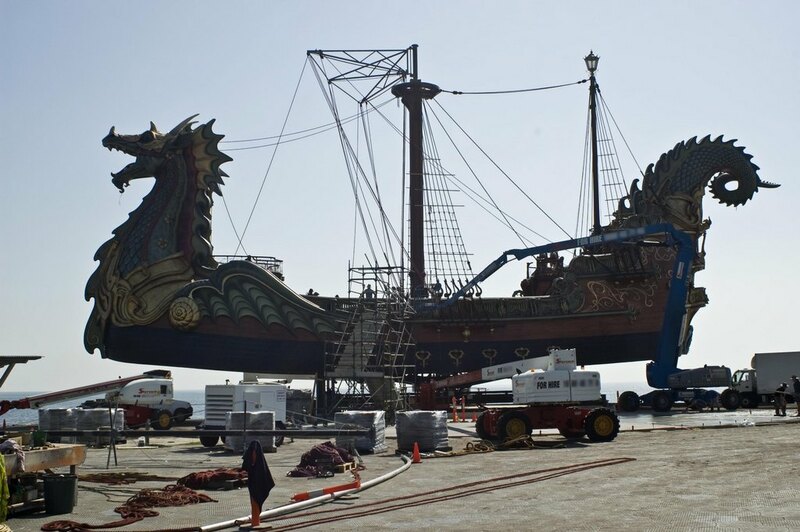 First and foremost, the filmmakers provide themselves with a strong foundation by actually creating a real Dawn Treader. The first time the dragon-ship comes into view, it’s a stunning moment. Mix that with the towering minotaurs and a magically flooded bedroom (still not sure how they accomplished a few shots) and you’re totally invested in this world as a reality. The action and adventuring as the crew fights slave traders is entertaining, but most of the heavy lifting comes from Lucy, whose anxiety concerning her physical appearance taps into the film’s wider themes of not allowing ourselves to fall to our darkest fears and desires. In this area of course the film’s Christian message is laughably veiled, as Aslan tells the children toward the end, “I am known by a different name in your world.” I might have more respect for the film if it just said “Jesus Christ” and got over it. At that point, why play coy? Further, for Christians the moment where Eustace is “re-born” is quite poignant, but for others it may prove problematic that the film fails to develop a gradual shift in his character to justify his vindication. When big displays of CGI are put to use, it usually looks pretty awful – especially when displayed in bright settings. Therefore, Treader‘s visually dark final battle allows the CGI to do its job – make you scared of the monster and prompt you to gleefully think “AWESOME!” when the battle begins. Dawn Treader has a lot going for itself. There are some cringe-worthy moments of dialogue, but it’s quite well paced with special effects that earn a tip of the hat. If you’re sans a magic wardrobe or painting, it’s worth paying money to visit Narnia’s Dawn Treader. This entry was posted in Reviews and tagged C.S. Lewis, Cinma, Fantasy, Film, Movies, The Chronicles of Narnia, Voyage of the Dawn Treader. Bookmark the permalink. as Aslan tells the children toward the end, “I am known by a different name in your world.” I might have more respect for the film if it just said “Jesus Christ” and got over it. At that point, why play coy? I’m not too fond of this adaptation, actually. The green mist, slave sacrifices, and the whole seven swords thing were quite pointless – and really irritating. Voyage of the Dawn Treader isn’t my favourite Narnia book, but I think it could have been adapted in a better way than this. I’m reading through it right now, but by itself as a big budget adventure film, it was adequate. Better than the second Pirates of the Caribbean film (I didn’t bother for thirds after that outing).